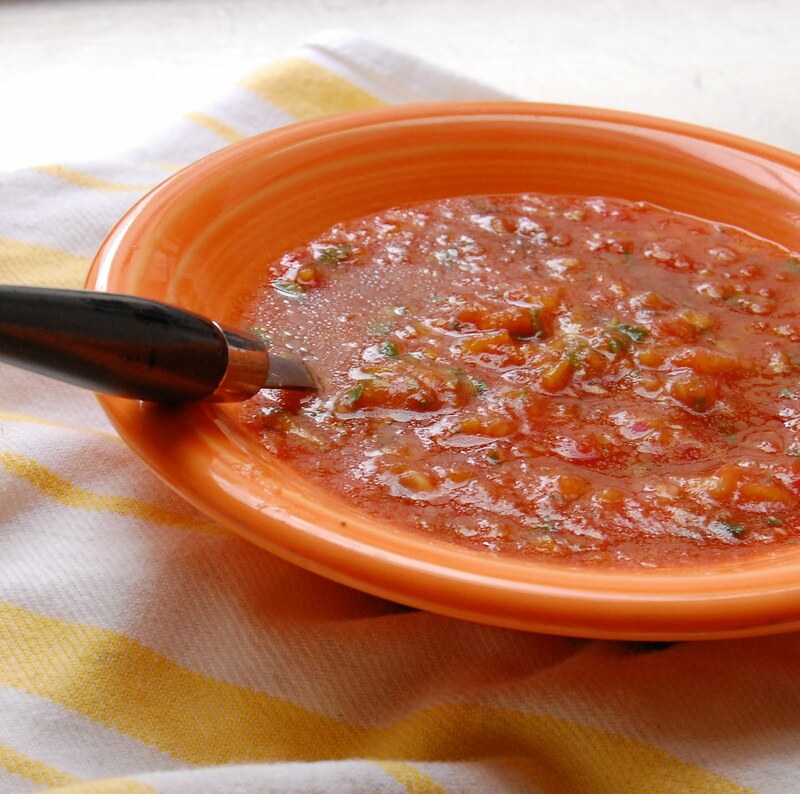 I can't officially call it summer until I've had a bowl of gazpacho. A soup that never fails in freshness, it is at once cool, savory and undeniably easy to prepare. It sends vitamins and nutrients sailing down the hatch -- a sure-proof way to OD on your daily veggie intake. I've made it many times, catering to its savory tradition, but this time I wanted to give the recipe a dash of sweet pizzaz, while maintaining the tomato base that I love. So I enlisted the mango -- an equally notorious symbol of summer -- to do the job. I have seen fruity gazpacho recipes before -- melons and mangos are often choice ingredients. Yet, rather than giving the fruit the staring role, I used it as a supporting member of the cast of other flavors. Inspired by several mango salsas that I have made, I combined the fruit with ingredients like cucumber, tomato, bell pepper and onion, knowing the flavors would marry well. Not content with just sweet, I also wanted to add a little heat to an otherwise cool dish. With several dashes of ground red pepper the soup was poised to to provide a rich complexity of flavors. A few hours of fridge-chilling later, summer had finally begun. 1. In a food processor, pulse each of the vegetables and the mango separately until the pieces are small and uniform; make sure not to over-pulse into a puree-- leave some pulp and texture. 2. Combine all processed ingredients in a large bowl. 3. Add garlic and the remaining ingredients. 4. Stir to combine, cover bowl, and let it sit for several hours to allow the flavors to blend. Stir before serving (chilled).